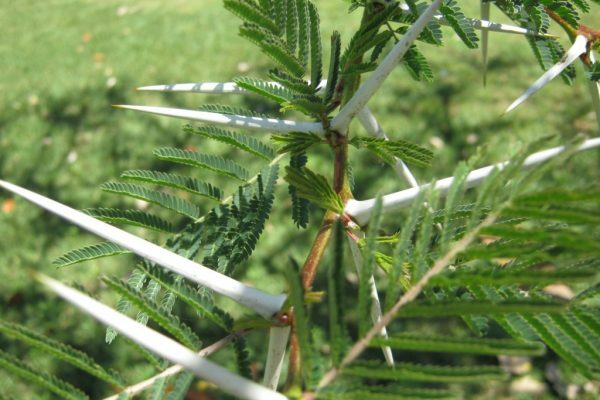 Most people would think of acacias (thorn trees) when thorns are mentioned, that is, the ones with long paired white thorns. 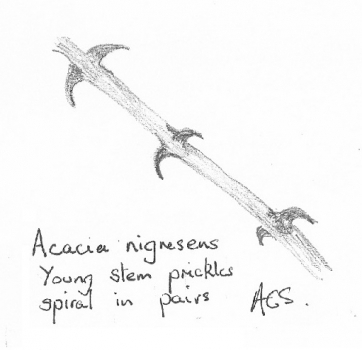 Acacias have now been split into two genera – an acacia with straight thorns is now called Vachellia and those with curved thorns are called Senegalia. 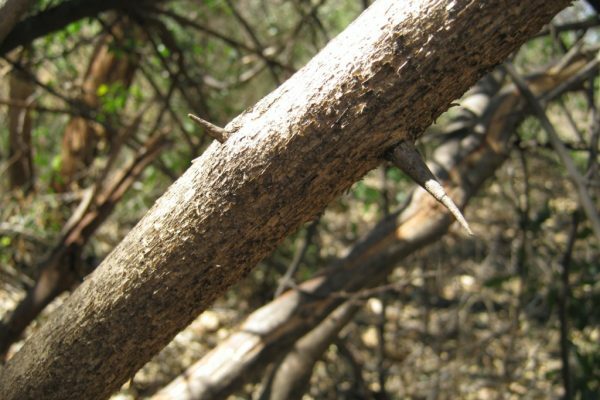 However things that can prick you come in a variety of different shapes and sizes and are called thorns, prickles or spines (spikes are an arrangement of flowers). 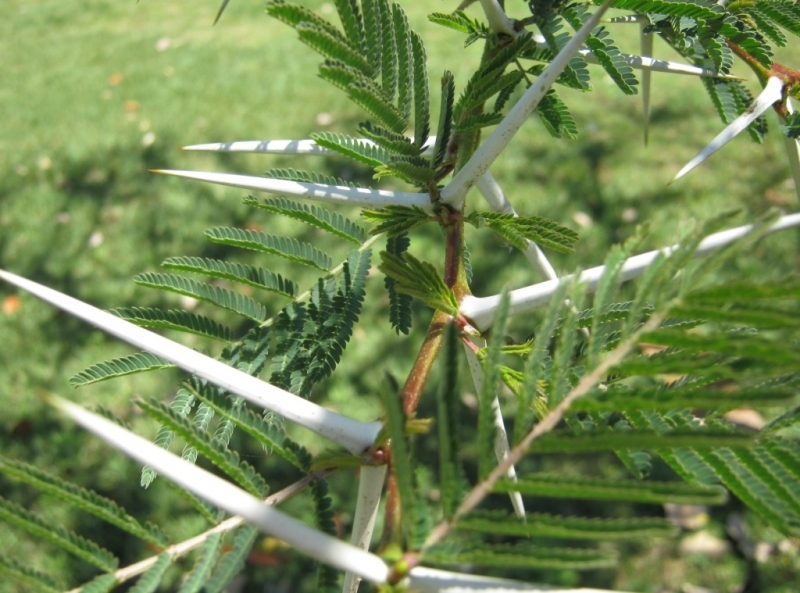 The thorn trees as we know them have had a recent name change which is rather unpopular with many tree enthusiasts – Acacias with straight thorns now come under the genus “Vachellia’ whilst those with hooked thorns are now in the genus “Senegalia”. 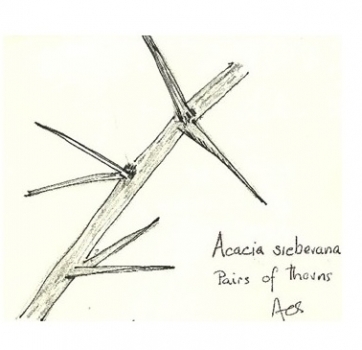 Not everyone knows that half of our Acacias have small hooked thorns. The purpose of these prickly things is a defence against being eaten. 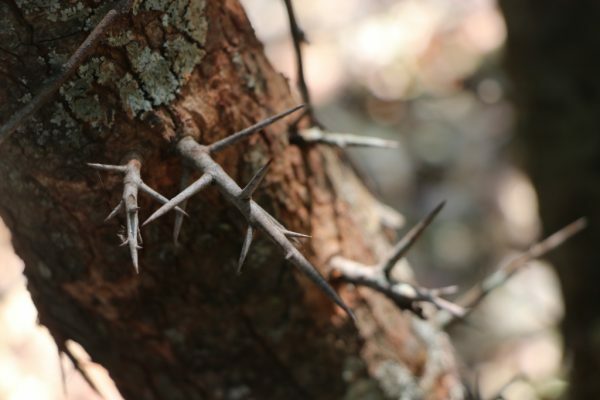 When a tree is young, it often has many thorns but as it grows to a height when animals can no longer reach the leaves, it sometimes dispenses with thorns as they no longer need the protection. 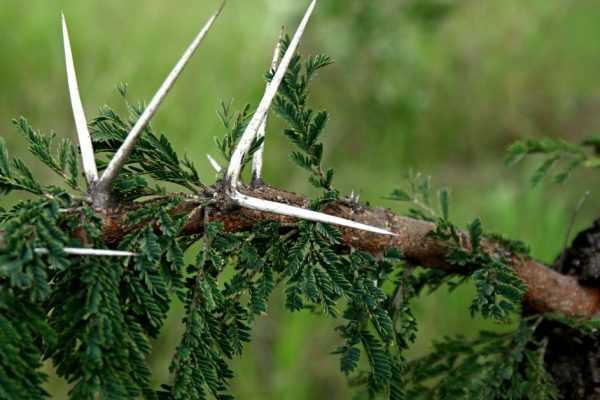 A thorn is a type of modified branch (a shoot) and together with leaves grows from a node. 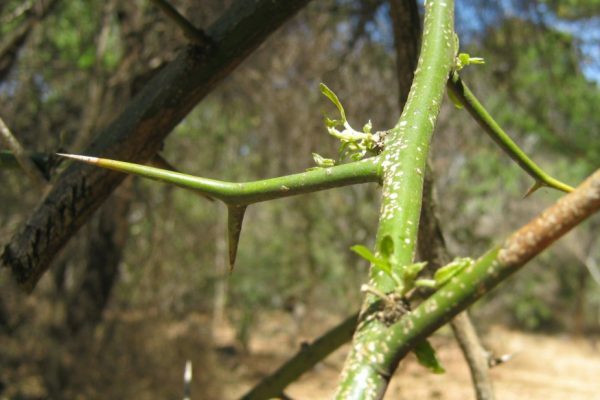 Vachellias have twin thorns while citrus tend to have single thorns. 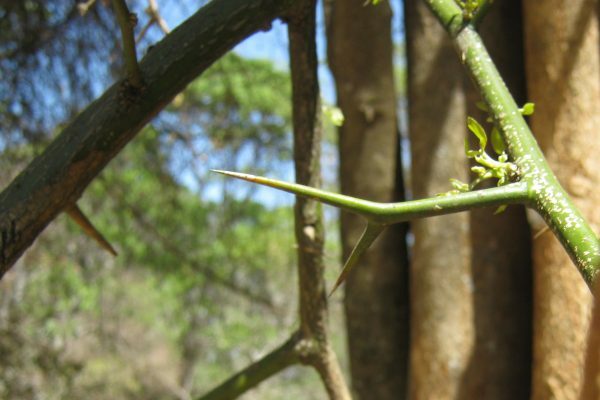 There are also “Y” shaped thorns that can be seen on Carissa bispinosa, Y-thorn carissa or Balanites maughamii, Torchwood. 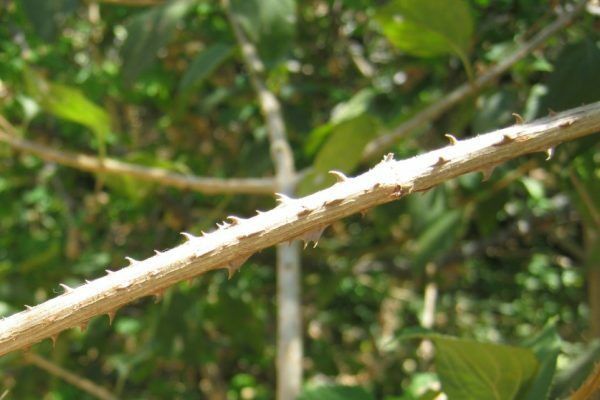 A prickle, such as in roses, is not a shoot and grows from the skin of the plant and can be snapped off if sideways pressure is applied. They do not grow at the nodes but can grow singly from anyway on a stem or even on the rachis of a leaf. Very young Erythrina abyssinica, Red-hot-poker coral-trees have many prickles on both sides of the leaves! 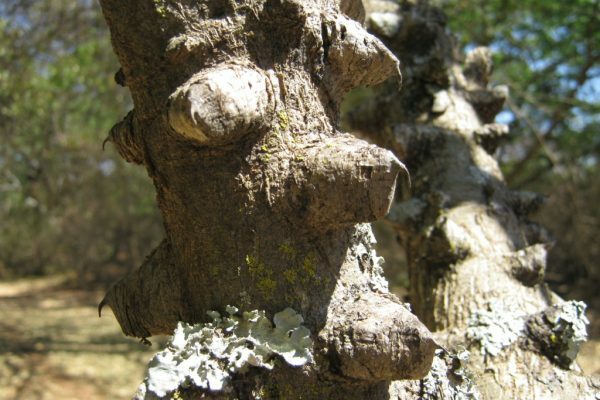 Spines are modified leaves or stipules. Dichrostachys cinerea, Chinese lantern or sickle bush has such spines. 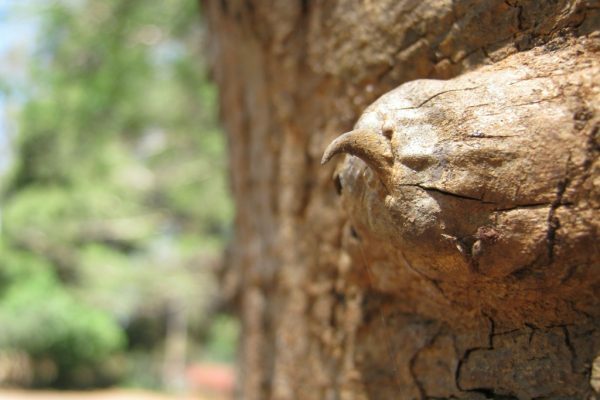 Spines can also occur on the edges of leaves as in holly or at the ends of the leaves as a spiny tip. 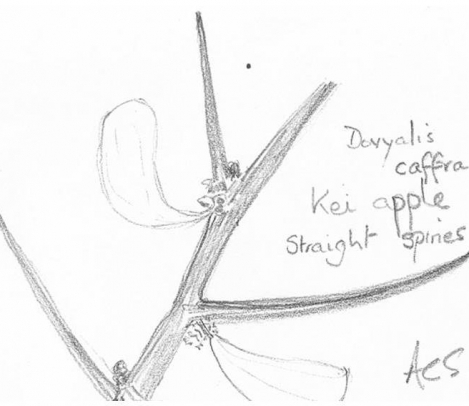 Flowers, leaves and fruit can all grow from a spine. The cactus spines are modified leaves. 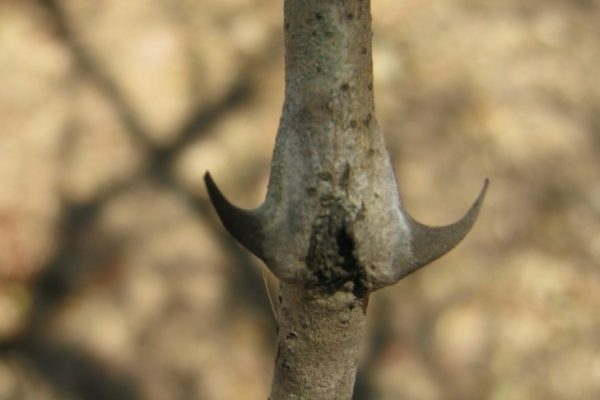 A knob-thorn is basically a knobby growth with a single hooked thorn growing from it – the best example is the Senegalia nigrescens, otherwise known as Knobthorn. 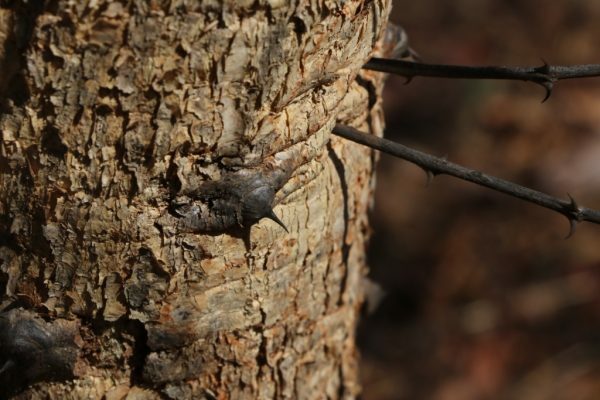 However many of the thorn trees with hooked thorns also have some knobthorns growing mainly on the trunk. 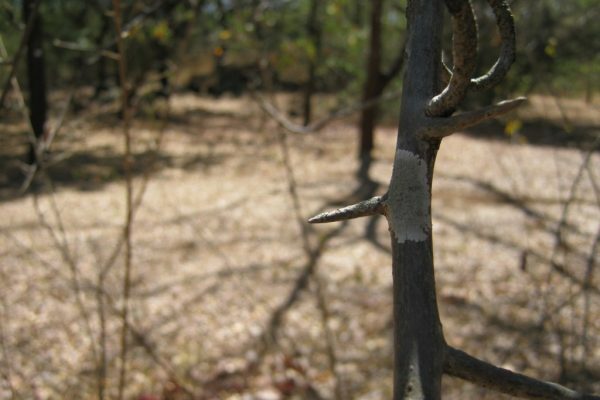 Then there are trees that have thorns and prickles – e.g., Vachellia tortilis. 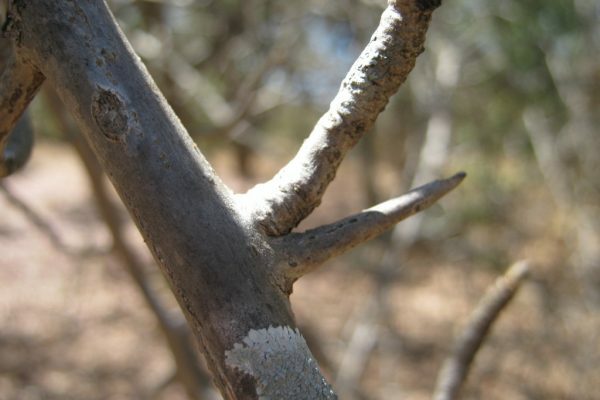 Umbrella thorn and some that have curved thorns and straight thorns such as Ziziphus mucronata, Buffalo thorn. 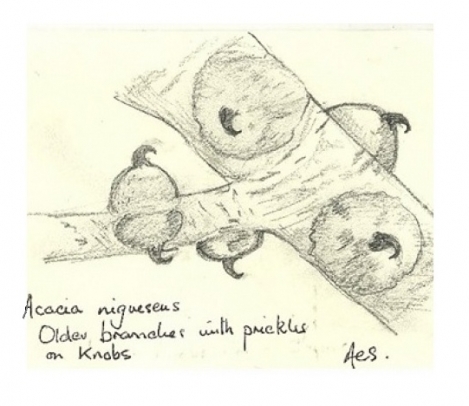 Click on the image below to view various prickly things.